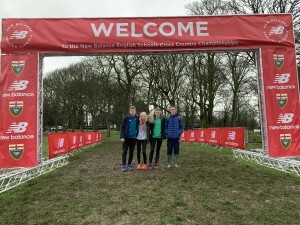 Four of our top junior athletes raced in the highest level of schools athletics when they represented Staffordshire Schools at last weekends English Schools Cross Country Championships, held at Temple Newsom, Leeds. 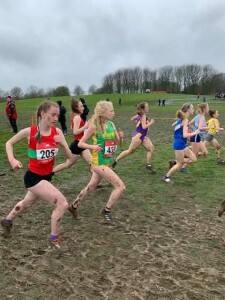 Having gained selection via qualification at district events last Autumn and then the county championships at the beginning of February, Nadine Tomkinson, Lizzie Clarkson, Lewis Nagington and Jacob Droogmans travelled on the team coach on Friday afternoon, before staying the evening in the team hotel, and then travelling the short trip to the course the next morning, gaining the full championship athlete experience. 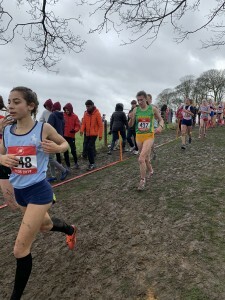 All the races were held over the undulating and increasingly muddy Temple Newsom course that was also used last year and the top eight athletes from each county were battling out for the top National honours. Nadine was in the Intermediate (Yr 10/11) Girls race held over 3710m and was in 5th position in the pen. As the first race of the day the course was in its best shape and Nadine ran a strong race finishing in 218th position in a time of 15:46 (that was an improvement of 43 places and 61 seconds since last years championships!) Nadine was part of the Staffordshire team that finished in 11th position. In the Senior (Yr 12/13) Girls race Lizzie competed over 4100m. Having won the trial and having becoming Staffs Champion Lizzie was first in the Staffordshire pen and used that advantage to make a great start. Lizzie settled into the race and began passing more runners as they tired, finishing in a fine 94th position despite being the bottom of the age group in a time of 17:03. We had Lewis and Jacob in the final race of the day, the Senior Boys (Yr 12/13) covered a by now, very muddy 6700m. Lewis was 4th and Jacob 5th in the pen meaning they were right in the middle of the action from the gun. Lewis was bottom of the age group but ran a intelligent race finishing as second Staffs Counter in 124th position in a time of 24:23. 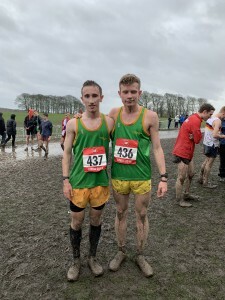 Jacob was competing in his 6th consecutive English Schools Championships, and having competed at every eligible age group finished off his schools cross country career with a fine run in 229th (25:38) bringing the Staffs team home in 30th position. Congratulations to all four athletes on your achievement in reaching and competing at the English Schools Championships, and especially to Jacob as he became only the second Newcastle (Staffs) AC athlete (also Sophie Goodfellow) in recent years to have qualified every year!